The day we’ve waited for. A must-see place. A beach lovers paradise. Indeed! Though we slept quite late on our second day we managed to wake up early but with no breakfast but coffee. We were picked up by our driver at exactly 8AM and waited for more than an hour at the port because the supposed joiners of the trip didn’t show up at all. It was supposedly 4 of us but it ended up just the 2 of us as if we rented the boat exclusively. We were too excited to see the beach and to sunbathe which kept us positive even after the long wait for nothing. I must say this is one of the downside of the being in a group tour as you would always have to wait for the rest before leaving, if you are to exclusively rent for your own boat then definitely there wouldn’t be any hassle but being in a group makes the tour more enjoyable because you get to meet new people and make friends. At around 930AM we left the port, it was a long but scenic one and a half hour boat ride from Coron to our first stop. Aside from the fees, this might be one of the reasons why only few people book for this trip as compared to the one we had on our second day. Malaroyroy Island was our first stop. It is located on the northern tip of Bulalacao Island beside Banana Island (Beach). Most part of the island is now privately owned by Two Seasons Island Resorts & Spa and only guests are allowed. Security guards all over the island maintain the exclusivity of the place. The island offers white sand beach perfect for swimming and a stone hill for a wider view of the island and the sea. You can even see fish just few steps from the shore. You can also rent a cottage or hut if you plan to stay overnight. The beach really looks lovely and would make you want to stay. We didn’t even notice that it’s almost lunch time and our boatman gave us even more time while trying to cook for us until we left at around half past 12. If you wish to go here without a package tour, you need to shell out 100 pesos per head for the entrance fee. It was quarter to one when we arrived on our second stop, Banana Beach, where we had a sumptuous lunch. We ate crabs, grilled fish and vegetable salad. Yum! You can also camp here overnight or stay in one of the cottages around the island. Hammocks are all over the place where one can relax. You can also kayak or simply play beach volleyball with your friends. We also didn’t notice the time while we’re there. The boatman had to remind us so we could leave in order to get to the next island. If you wish to go here without a package, it would cost you 200 pesos per head for the entrance fee. Our last stop: Malcapuya Island. It was half past two when we arrived in the island. 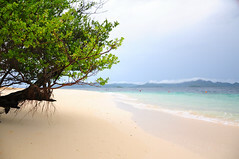 The island is about 30 kilometres south of the Coron Poblacion and east of Culion Island is a sub-cluster of islands that includes Malcapuya Island, Dicalabuan Island, and Bulalacao Island. 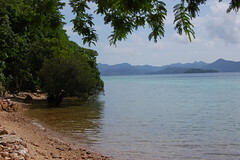 Because of its distance from the main town of Coron, the island remained quite undeveloped with only one house-like accommodation and few cottages. Malcapuya has long white sand beach that makes it perfect for swimming, snorkelling and even water sport like Kite Surfing. 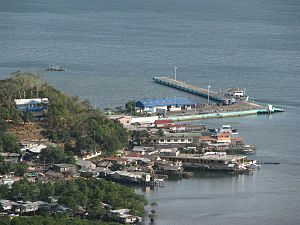 The island also has a hill wherein you can go for a panoramic view of the surrounding islands and the ocean. While in the island, we had fresh coconut water. Life Is Good! If you wish to go here for a day tour, you need to shell out 150 pesos per head for the entrance. It was almost 4PM when we left the island; we were warned that strong winds in the late afternoon might make it more challenging for the boatmen to manoeuvre the boat. This time we joined another group on our way back to Coron as our boatman decided to stay. Indeed waves are quite strong but not as scary as the one going to Calaguas Island in Bicol. Our boat this time has a bigger engine so despite the waves we arrived back at the port just before half past 5. Our boat parked near La Sirenetta where Liezel waited to check on us and to bring us back to our lodge. After shower, we went back to town in search for a place to eat. We asked one of the locals around and recommended FoodTrip where we had different varieties of noodles plus calamari. Right after dinner, we then suddenly wanted something cold and ended up having Banana Peanut Shake in Ice Valley. Slurp! It was half past 8 when we decided to go back to our lodge. Since it was still early, we wanted to try walking our way back to the lodge but ended up riding the tricycle halfway through because of stray dogs. Haha! Wonderful goods from you, man. I have consider your stuff prior to and you’re simply too fantastic. I really like what you have got right here, certainly like what you are saying and the way in which you assert it. You are making it entertaining and you continue to take care of to stay it sensible. I cant wait to learn much more from you. This is really a wonderful website.